With the positive response from my last frugal chicken recipe, I will post another one of my favorite recipes. 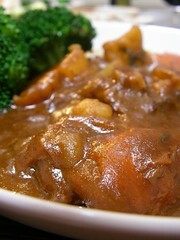 Beef Stew is high in protein and flavour, low in fat and cost. In addition, beef stew is usually cooked in bulk so that it will feed a large family and/or multiple meals. 1-2 tbsp Extra Virgin Olive Oil or other oil of choice. Wash then slice and dice potatoes, celery, carrot and mushrooms to bite sized pieces. Heat up a large pot over the stove and add olive oil. When it's nice and hot (starts to bubble), put in the stewing beef cook only a few minutes until sides are brown. You want to leave the center a bit undone as it will slowly cook itself during the rest of the process. Add celery, potato, mushrooms, carrots. Stir for a few minutes. Bring to boil, let simmer on low heat for around 30-45 min. Prepare small bowl of 1-2 tablespoon(s) corn starch and a few ml's of water. Add enough water so that the corn starch has a thick consistency when stirred. If the stew isn't thick enough after simmering for the alloted time, stir and add a mixture of cornstarch and water. Voila, supper for the whole family with perhaps enough for lunch the next day. I can see this recipe working great in a slow cooker also. A pretty frugal recipe is to eat a lentil soup or a beans soup. With lentils costing about 60 cents for a packet, you can buy some seasonings for 1-2 dollars, a diced tomatoes and tomatoe sauce cans for 50-70 cents and there you go- a meal that would last for one person for about 5 days ( lunch and dinner). I love to quinoa and brown rice mixed with lentils and some sauces or spices. Its extremely cheap, quite healthy (frozen veggies can be “healthier” (in a vitamins sense) than fresh depending on how long after being picked they are consumed). With a possible worldwide famine coming, you can help mitigate the rising costs of food by eating less. You’ve been in my cookbook again! Actually I use almost the same recipe, but I put the the entire thing in a slow cooker first thing in the morning. Then I cook it all day and just about 30 minutes before eating I add the finishing touch: 1 tsp curry. Don’t ask me why it works so great, but I love that taste of this in my stew. Mmmm. Add polenta to the side, and it’s just like nonna’s. Take the wonderful FT succulent stew with the curry added, placed in a casserole dish & topped with a flakey pastry crust then baked for 30-minutes. I believe that everyone has made your recipe of FT stew, eaten it, and are now happily full and sleepy. Great choice… there are so many varieties of the above recipe… just substitute a few ingredients for others and you have an endless array of flavour combinations that will keep your stews interesting and delicious. And not only are stews frugal from a money perspective, they are also frugal on the time… they take a while to prepare, but subsequent servings are as easy as 10 minutes in the microwave. Very helpful for families with two working parents! I like to do my stews in pressure cooker, retains vitamins and very frugal on energy. Cook a stew in less than 15 mins and mostly on Min setting(Once the steam is brought to pressure, usually about 5 mins) The meat is pull apart tender every time. Next post: Ask the Readers: Giving Money as a Gift, How Much?